Props, props & more props! We have sourced the earth to find stylish & fun photo booth props to compliment any event. Every photo booth comes with our standard props* shown below whilst we also have the perfect themed prop kits to add on for those special events. *Please note: Our standard prop kits includes the above or a variance of the above pictures. We only place enough props out to suit the table size, if the prop table your venue supplies is small we will place a range of props out but not all of the above. Play some sweet sounds from our tune makers SunnyLife Music Prop Kit. Close your eyes, feel the rhythm and shake it in the booth. Not sure what to do with your hands while posing, add these great musical props which not only look great in photos but entertain in and out of the booth. Look fresh in and out of the booth with this season's most on-point accessories the SunnyLife Sunnies Prop Kit. 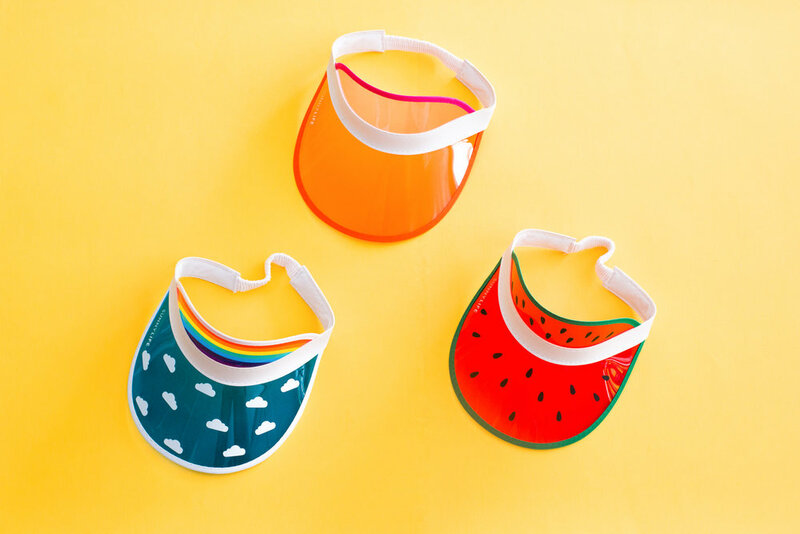 Don't mess your hair with these super cool retro feel SunnyLife visors! We all have that friend who will rock every single one of these latex masks, and will most probably end up on the dance floor with a unicorn head. How to become a Super Hero? 1. Work on your strength. Youâ€™ll need it to look like a superhero and to defend yourself as a last resort. 2. Improve your stamina and take a martial arts or self-defence class. 3. Eat a healthy and balanced died. 4. Ignoring steps 1, 2 & 3 choose your disguise and jump in the booth. BOOM! You are a superhero! Keep your heels, head & standards high ... or just wear Gold!